Because it’s Friday, it’s going to a a two-fer kind of posting day… Crockpot cooking can really make or break you. And living in New England where we have those snowy winter days where you just want to throw a bunch of stuff into that crockpot, then curl up on the couch with your blanket and a book and forget about food for a few hours – it’s really easy to be broken instead of made. Here, we’ve been slammed by a classic Maine winter. We haven’t had snow like we’ve had this year in quite awhile. While I’d love to sit and reminisce about childhood snowman memories, snowball fights and the whole nine… I can’t. As an adult, I have to shovel, snow blow, plow, fight my way through slow moving traffic on slick and dangerous roads to get to work to make money to pay bills… the fun stuff gets put on hold. Coming from an Italian family, my mother’s love for cooking has clearly been passed down to me. I love to cook and for the decade that I’ve been living as the eater I am, I’ve also come to love the challenge of sticking with my guidelines to either create a new recipe from scratch, cook one from one of my magazines or find a way to make something from a handed down cookbook be something that suits my lifestyle. Sunday dinner with my family was canceled because of the snow a few weeks back, so dinner fell to me to cook for my husband and I. I haven’t used our crockpot much this winter, so I pulled it out and started scouring my stack of cookbooks and magazines. Finding one that fit the mood of the day, I began prep work. Pacific Natural Foods makes a yummy organic cream of chicken soup that I’ve used in many different recipes. On a whim once, I bought their organic cream of mushroom soup to try as well. A recipe in my Taste of Home slow cooker book from 2008 had just the recipe to try in which I could see if the mushroom soup was just as good as the chicken. Brown the chicken in a skillet with oil on both sides. 5 minutes each side usually does the trick on med-high heat. Transfer browned chicken to a 5-qt slow cooker. 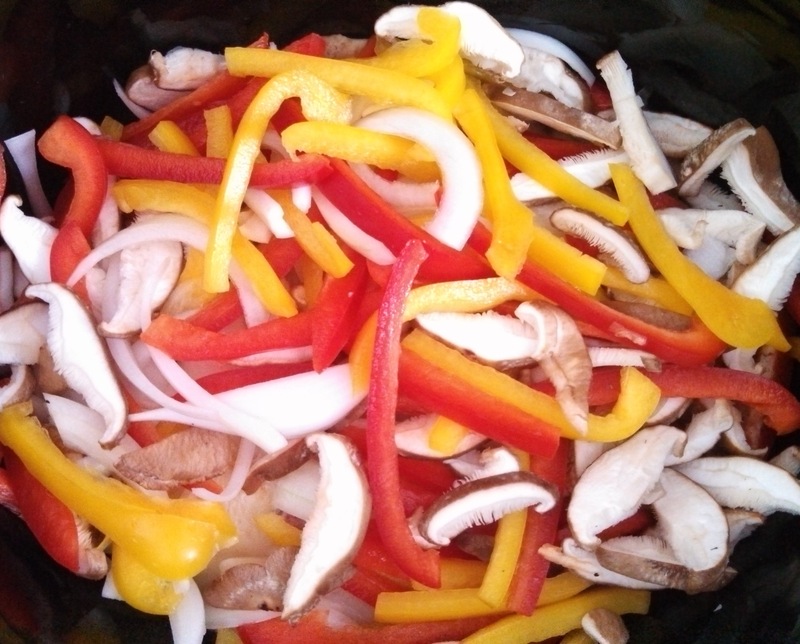 Add mushrooms, onions and peppers, just topping the chicken. In a bowl, combine the soups, then pour over vegetables. Cover and cook on low for about 5 hours, or if you have a meet thermometer, until the chicken reads 170-degrees. Serve with the rice. Why I don’t do Paleo.